Admission: Adults $10; Children $6 (5-12 years), free under age 5; $8 Seniors (over 65); $4 qualified school groups and clubs. No credit cards accepted. Demetre, Jim. "The Seattle Chinese Garden: A Landscape Lost in Translation." Artdish: Puget Sound's Forum of Visual Art. May 2002. JGarden Description: Bainbridge Island is reached via the Seattle-Bainbridge Island ferry from Seattle (ferry departs from Madison and Marina in downtown Seattle, every half-hour to hour), or the Agate Pass Bridge from the Olympic Peninsula; both cases, take Route 305, turn north onto Dolphin Drive and continue to the Reserve. This is a sublime garden that is totally worth the $20 ferry ride. In addition to the Japanese-inspired guest house and garden, there is a beautiful woodland walk, moss garden and bird sanctuary. A lovely French country house built in 1931 now serves as a visitor center and overlooks Port Madison Bay. The entire garden covers 150 acres, 84 acres of which are covered with impressive second growth forest. Once the home of the Bloedel family, the Reserve is now managed by the Arbor Fund. The Japanese garden features an interesting guest house designed by Paul Hayden Kirk in 1961. This building combines elements of a traditional Japanese tea house with those of a Pacific Northwest Indian loghouse. The rocks and plants around the structure are the work of Kubota Fujitaro. 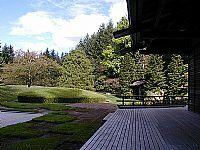 Adjacent to the guest house lies a very successful raked sand and rock garden built in 1986 by Dr. Kawana Koichi, a professor of landscape architecture at the University of California. Dr. Kawana edged this dry garden with an irregular checkerboard of alternating greenery and square flat stones which borrows from Shigemori Mirei�s famous 1939 design at Tofukuji Temple in Kyoto. Events include talks and concerts --- check the website for details and a current schedule. Bloedel, Prentice. "The Bloedel Reserve: Its Purpose and Its Future." University of Washington Arboretum Bulletin. 41:1, Spring 1980, pp 2-8. Brown, Richard. "The Japanese Garden: An Evolution in Time." The Bloedel Reserve. 2:2, Summer/Fall 1990, pp 1,4. Frey, Susan Rademacher. "A Series fo Gardens." Landscape Architecture. Vol 74, no 5, May 1986, pp 54-61,128. Haag, Richard. "Contemplations of Japanese Influence on the Bloedel Reserve." Washington Park Arboretum Bulletin. Vol 53, no 2, Summer 1990, pp 16-19. Lowry, Deci. "The Moss Garden at Bloedel Reserve." Pacific Horticulture, Vol 51, no 1, January 1990, pp 16-20.